HEMP is defined as an instantaneous, intense electromagnetic pulse (EMP) field that can overlaod and disrupt from great distances electrical systems and microcircuits. It is generally assumed if one occurred it would be set off by a high altitude nuclear explosion; obtainable by missle flight1 or, more recnetly believed, from a satellite. The only real defense for an event is with HEMP shielding. IEMI is defined as an intentional malicious generation of electromagnetic energy introducing noise or signals into electric and electronic systems, thereby disrupting, confusing or damaging the systems for the purpose of criminal or terrorist activities2. It would be a smaller scaled attack than HEMP, but have like consequences for systems that are targeted. It’s not “if”, but “when”. The inevitable need for EMP shielding recognizes a simple fact: The likelihood of a HEMP attack or IEMI event is growing greater with each turn of the page in the rogue political, terrorism or criminal playbooks. Just this past March, retired CIA Director James Woolsey highlighted the need for HEMP shielding of our power grid as he reiterated his long-standing alarm about North Korea’s capabilities in carrying out a high altitude electromagnetic pulse attack. Other analysts point to China, Russia and Iran as having HEMP capabilities as well. We have known about the potential threat and large scale devastation an EMP attack could pose for at least five decades; power grids going down, telecommunications systems knocked out, supply chains broken and the eventual collapse of society as we know and enjoy it. This has pushed the need for HEMP shielding to the foreground for the military, while other experts have called our attention to the ramifications this has for medical, banking, food, water and other life-sustaining industries. As if the need for EMP shielding because of the possibility of a HEMP attack wasn’t enough, consider a new, more likely threat; an IEMP (intentional electromagnetic interference) attack. This is basically a HEMP attack on a smaller scale. For a few hundred dollars and with a small truck to discretely slip in and out of local areas, any criminal or terrorist group could easily construct a device to be aimed at critical targets; banking systems, hospital communications and data, local water sources, telecommunications towers or even cars. Any system that relies on computers and microcircuits to operate could be shut down or hacked from the target’s own parking lot. This wouldn’t just cause local disruption but as we saw in previous power outages, when one local system goes down it overloads others trying to take up the slack. Due to the inexpensive requirements, the unpredictability of an IEMI attack and the difficulties of preventing or catching small cells of terrorists from an “attack – move – attack again” campaign, the best defense is by proactively protecting computer, power grid, GPS receivers, communications, banking kiosks and other susceptible electrical systems with IEMI shielding. The only sensible way to protect data and equipment from a HEMP or IEMI attack is with EMP shielding, like that found with a “Faraday Cage”, or hardened enclosure. This electronically conductive enclosure has all penetrations electronically shielded to prevent an EMP from destroying or disrupting the purpose of the electronics inside. 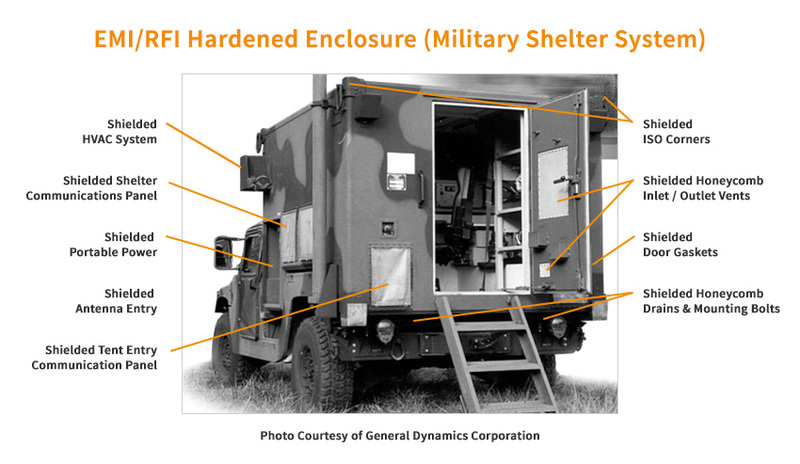 As seen by the military application illustration below, all components within the enclosure must be hardened against anything which could act as an “antenna” for a HEMP or IEMI blast. Power, data and control cables, access points, ventilation systems and structural seams are just a few points of susceptibility. A hardened enclosure is only as good as its weakest point, meaning everything needs consideration, even down to structural bolts and floor drains, or the hardened enclosure will fail. Military and civilian specifications and mitigation guidelines for EMP shielding are different, and each application calls for unique solutions. MAJR Products offers a complete product line of IEMI shielding and HEMP shielding products, and it would pay to take a look as our exhaustive list will undoubtedly tic a few boxes for things not previously accounted for. We also offer product and application consultative assistance from leading EMP shielding experts.